GAUGE: Unimportant, just needs to be tight enough the Polyfil doesn’t show through. 1. Read through instructions before beginning. 2. About the colors. 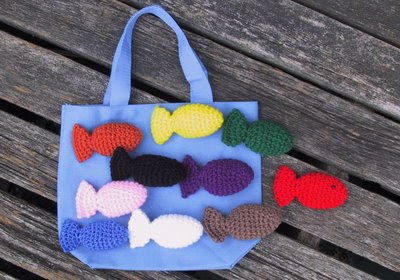 The fish would be cuter with multicolored yarn or stripes, but when kids are learning the names of colors, that would be confusing. If you want to use different colors, use ones that there is no ambiguity about what color they are. 3. When joining with a slip stitch, pull the stitch tight until it almost disappears. 4. The first stitch of each round is made in the join. 5. sc2tog = Insert hook into stitch and draw up a loop. Insert hook into next stitch and draw up a loop. Yarn over, draw through all 3 loops on hook. Stuff the fish lightly with Polyfil. Remember it’s a fish not a turnip, fish are sort of flat. If you want to add eyes; use yarn and French knots or a small dot of 3-D paint on each side of fish’s head. DO NOT add beads or buttons as children could choke on them. The 3-D paint sticks very well, even if a child did pull them off they are too small to cause choking and aren’t toxic. Fantastic toy. Thanks so much for your wonderful design. What a wonderful toy. I'm sure my neighbour's boy will be thrilled with it. Many thanks for sharing. I was wondering if you have a crochet pattern for the sasquatch furry booties? No I haven't written a pattern for a crocheted version. Cute fish! I'm gonna make one. Can you tell me what the abbr. mean? I am very very new at this. There are several good web sites that explain the abbreviations. This one is good. This is just too cute! My son is learning his colors now, I am going to whip up a few for him. Guess that mean I'll have to make 2sets. My 4 year old has known all her colours for over 2 years, but she'll like playing with the fish. Thank you for such a cute pattern. That is so clever and very cute. Well done as always. Fantastic work. This is so easy to make and this looks is very colorful you used Red, Yellow, Blue. Orange, Green, Purple, Pink, Brown, White, Black colors in this fish. This is such a neat idea! I'm a special education teacher always looking for innovative educational toys. They offer a big number of possibilities, sorting, counting, learning the colors... And they are totally eco friendly! Thanks for sharing the pattern, I'll do my set ASAP. This basic fish pattern could easily be adapted to make a child's bath mitt, large enough for an adult hand to fit inside. Made with a soft cotton yarn, it would be a fun item to include in a baby shower basket. HEllo- I was wondering if I could make this into a finger puppet by leaving a hole in the bottom seam....if I did that, would you know which row I would do that in, and how? Thanks so much! Guess you could leave out the stuffing and just fasten off beofre the last round. Have you seen my finger puppet patterns? They are listed on the the side bar under toys. The octopus is really cute made up.